Flying winger Greg Eden is ahead of target to smash every record for try scoring for Castleford Tigers after continuing his amazing run in the Bank Holiday double-header. The 26-year-old followed up a third successive hat-trick in Friday’s game against Widnes by scoring four at Leigh on Monday and now has 28 tries in all games this year – just 14 behind the club record tries in a season set by Denny Solomona last year with a minimum of 15 games left. The Super League record for a season was also set by Solomona when he crossed 40 times in 2016 and Eden is currently on 25. Eden, meanwhile, has two records already under his belt for 2017 as he has become the first player in the professional game to record four successive try hat-tricks. 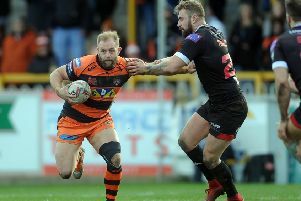 He also recorded the fastest hat-trick in Super League history and the fastest on record in any professional match with just four minutes and 59 seconds separating his three scores at Leigh Sports Village. “It was pretty quick. I didn’t really think about it at the time but it was just after when people were asking me,” said Eden. On the possibility of breaking Solomona’s records, Eden said: “I’m not really thinking about it but I am well on the way for it. “If we keep playing the way we are hopefully it is in sight and we just have to keep winning games and see if it comes to us. “We had a real tough first 20 minutes or so at Leigh where we were battling it out but then seemed to hit our straps and kicked on from there. “We just struck to our plan, eventually they just cracked and we started to hit our straps after that mark. I don’t think there was any turning back when we got to that stage.